Photo illustration courtesy of Idaho Power The poles shown here are one option that Idaho Power has put forth to transmit electricity to the northern Wood River Valley. 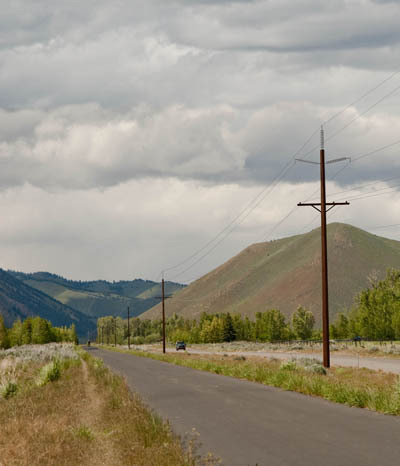 Idaho Power Co. is slowly but surely moving forward with its Wood River Electrical Plan, including the installation of a backup transmission line that will run either overhead or underground from Hailey to Ketchum. Idaho Power recently held "neighborhood meetings" to reach out to the property owners that will be most affected by the new Hailey-to-Ketchum line. The meetings were held at the Community Campus in Hailey on July 18 for residents of Silver Sage, Coyote Bluffs, the Northridge area and the Buttercup area, and at the Sawtooth Botanical Garden south of Ketchum on July 19 for residents of Ohio Gulch, the Alturas Drive area, Cold Springs and The Meadows. Idaho Power held a conference call Tuesday to "debrief the results" of the neighborhood meetings and to "discuss a timeline" to get the ball rolling on the new transmission line, company Communications Specialist Lynette Berriochoa said. "Open public outreach meetings will be scheduled soon," Berriochoa said. "We're trying to move right along with setting meeting dates, then hopefully we'll be ready shortly to submit our application to Blaine County for project approval." However, much remains to be decided before Idaho Power finalizes its application to the county's Planning and Zoning Commission. The project—which calls for running the new line along state Highway 75—has been under consideration for years, yet a finalized design is still far from completion. Currently, the north valley is served by a single transmission line that runs east of Highway 75 into Sun Valley. The question is no longer whether a redundant transmission line from Haley to Ketchum is necessary. At this point, Idaho Power and the Community Advisory Committee—a group of 19 valley representatives organized in early 2007 to advise Idaho Power on local interests concerning the project—have established that the north valley needs a backup line for power reliability and public safety. "Idaho Power is legally responsible to the Idaho Public Utilities Commission to provide reliable power to its customers," former County Commissioner and current Community Advisory Committee member Len Harlig said. "The power company has demonstrated a sufficient need for this upgrade. They are serious about getting this done because they are responsible to." The questions are now what the new line will look like, whether portions of it will be underground, and where exactly it will meander up the valley. "For an overhead line, the posts could be as tall as 85 feet," Berriochoa said in an interview. "The Community Advisory Committee has recommended a low-profile, 47-foot pole height. This option would be possible if we combine the new transmission line with the current distribution line on the same poles. The current transmission line would remain separate, for redundancy. The height of the new poles will depend on the final arrangement of the lines." In that scenario, the new transmission line would be placed along the route followed by the existing distribution line next to the highway. The only difference would be a slight increase to the pole height to accommodate both lines. Though some valley residents have expressed concerns that the poles will have a looming, industrial look, the Community Advisory Committee has worked hard with Idaho Power to consider the aesthetics of the project. Currently, no choice has been made as to whether the poles will be made of wood or steel. However, if steel is used, the alloy selected will have as minimal a visual impact as possible. "The alloy we're looking at is called COR-TEN steel." Berriochoa said. COR-TEN is a weathering steel that was developed to eliminate the need for painting. It forms a stable rust-like appearance over time. "It would look very similar to the wooden poles," Berriochoa said. "We want it to be as low-profile as possible. The nice thing about steel is that it's stronger than wood so you need fewer poles to make the same span." Harlig seemed to have a different take on the look of the poles. "It's going to be hard to ignore the new fixtures," he said. "They're going to be a pretty good size. If there were another alternative, we'd all be raising our hands for it." Originally, the pro-underground Community Advisory Board did not want to have anything to do with an overhead line. Then board members learned that an underground line would cost about 10 times the cost of an overhead line and that the difference would have to be paid by the community. That's not an Idaho Power policy—it comes from the Idaho Public Utilities Commission. "Certain sections are still being considered for underground," Harlig said. "Some sections of the existing transmission line in Sun Valley are under consideration. Those might be paid for privately by certain landowners—perhaps part of the section for the new line from the hospital north. Exactly where they stand on this today, I can't tell you." At the very least, it seems unlikely that the whole run from the Hailey substation to the Ketchum-area substation will be underground. "Not everybody will be willing to pay for underground," Harlig said. "There are folks concerned with aesthetics and others concerned with practicality. When the discussion for underground versus overhead picks up during the public outreach meetings, I'm sure many valley residents will be interested in attending." Much of the argument for attempting to bury the line is that the aesthetic impact of an overhead line would have a negative impact on tourism. Harlig expressed an interesting perspective on that issue. "Being without power during the winter is not very enticing marketing for tourists," he said. That became clear to valley residents and tourists alike during the now infamous 2009 Christmas Eve sustained blackout. However, it would not have been prevented by a redundant line from Hailey to Ketchum because the problem occurred with the feeds south of Hailey. Nevertheless, it did bring attention to the state of the valley's electrical system. Beyond a redundant line from Hailey to Ketchum, work needs to be done on the lines getting the power to Hailey, which is the hub for the whole Wood River Valley. The two lines feeding the Hailey substation—one from the Midpoint substation near Dietrich and the other from the King substation near Hagerman—were meant to be redundant, but demand has increased so much that one of the two lines can no longer carry the whole load. If power doesn't get to Hailey, it doesn't matter how many lines you have running north. They will all be dead. "It won't be the first time this issue has geared up, and it probably won't be the last," Harlig said. I don't know why Idaho Power isn't moving on this more quickly."